Holcomb Station was designed and constructed as a reliable, economic, and environmentally responsible source of electric power for western Kansas. Construction began in May 1980 and was completed on August 16, 1983. 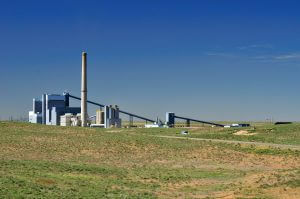 HL1 burns low-sulfur coal that is mined in Wyoming’s Powder River Basin and shipped to the station by rail. Once on site, the coal is tested and stockpiled. When reclaimed into the unit, coal is ground into a powder finer than talcum powder and burned in the furnace. The intense heat released inside the furnace is absorbed by pure water circulating inside steel tubes, a process that converts the water into steam. This high-pressure, high-temperature steam is directed into the unit’s steam turbine, causing its rotor to spin at a high speed, turning the generator and producing electric power. Exhaust steam from the turbine enters a condenser to be cooled and returned to a liquid state so a series of powerful pumps can deliver the water back to the furnace to continue the process of producing reliable, clean electric power. Sunflower’s transmission network carries electricity produced at HL1 to the bulk electric system where the power flows to the market. HL1 is Sunflower’s primary generation resource. Designed and operated as a zero-discharge facility, HL1’s wastewater from operation of the facility is captured in lined storage basins, eliminating the possibility of contaminating area ground water. The captured wastewater is also processed and reintroduced into unit systems, making the facility very water efficient. Six industrial water wells, located on Sunflower’s property, provide the water necessary to operate HL1. All water used is closely measured and reported to ensure optimal efficiency of the station’s systems. HL1 is one of 36 plants built in the United States after 1978 that had to meet more stringent federal clean-air requirements. Sunflower is limited to releasing just under one-half pound of SO2 per million British thermal units (Btu) of heat input. Thanks to Holcomb Station’s sophisticated equipment, the plant normally operates at only .10 to .20 pounds of SO2 per million Btu. Clean air equipment on HL1 accounted for about $67 million of the plant’s total original cost of $441 million. HL1 utilizes a “dry scrubber” SO2 removal system, using a proven “spray drying” technique that has been used commercially since the 1920s. Inside the scrubber, alkali slurry is sprayed in a fine mist into the furnace exhaust gases to efficiently mix and react with the small amount of sulfur in the coal combustion gases. This chemical reaction forms solid particles of calcium sulfite and calcium sulfide that are captured in the unit’s fabric filter baghouse along with more than 99.98 percent of fly ash produced. These solid waste materials are permanently disposed in a dry, dedicated landfill located on station property. The treated exhaust gas is continuously monitored to ensure compliance with the unit’s strict environmental permits before it exits through the unit’s 474 ft. main stack. To learn more about the environmental controls at Holcomb Station visit the Holcomb Station Emissions page. The HL1 generating unit was initially equipped with a state-of-the-art sulfur dioxide (SO2) scrubber. At the time of its construction in 1983, it was the largest scrubber of its kind in the world. This scrubber is especially practical for removing SO2 from the gases that result from the combustion of low-sulfur coal like that which is burned at HL1. This scrubber, in addition to removing SO2, is particularly effective in controlling the sulfur trioxide (SO3) precursor to sulfuric acid mist and the other acid gases that can react in the atmosphere to form fine particulate matter. In conjunction with the scrubber, the fabric filter (baghouse), which is used to control particulate matter in the stack gases, is excellent companion equipment. Together they serve to control the release of hazardous air pollutants from the stack. HL1 is a zero-discharge facility for waste-water. Industrial facilities, in general, and power plants specifically, discharge waste-water to a nearby streams or rivers. However, at Holcomb all water is recycled or reused for purposes that would otherwise require the pumping of additional groundwater. The dirtiest waste water at the plant is used for procedures that do not require cleaner water, leaving the cleanest waste-water to be treated and reused for cooling water purposes, the largest use of water at the site. Few power plants are designed to optimize water use as has been done at HL1. In 2011, HL1 was fitted with state-of-the-art Hitachi low NOX burners. HL1 underwent a 7-week outage to allow for the LNB technology to be installed. During the outage a separate over-fire air system (OFA) was also installed at a cost of $22 million. This environmental control technology reduced the unit’s NOx emission by nearly 50 percent and ensures the unit meets the stringent regulations related to the Cross State Air Pollution Rule (CSAPR). In 2014, HL1 was fitted with equipment to store and inject Powder Activated Carbon (PAC), which reduces mercury emissions in coal-fired boiler flue gases. The technology works by injecting PAC from a storage silo into the flue gas ductwork where it absorbs mercury and is collected along with fly ash in the plant’s fabric filter baghouse. PAC injection commenced in 2016 and ensures that HL1 is in compliance with the Environmental Protection Agency’s Mercury and Air Toxic Standards. Click the link below to access the CCR Rule Compliance Data and Information.